Psalm 119 is perhaps one of the most well-known psalms in the whole Old Testament. It is certainly the longest of the psalms, sitting at 176 verses. The focus of the chapter is the treasure of the Word of God, communicated through the terms “law,” “precepts,” “commandments,” “rules,” “statutes,” and “testimonies.” The psalmist loves the Word of God and sees all the benefits that belong to him as ar result of treasuring that Word. One such aspect is the idea of flourishing. Obedience to the Word of God leads to human flourishing. It is tempting to believe that, because of the Fall, there is only devastating, destruction, and resistance in this life. Faithful doctrine does teach that labor will be hard and compounded by “thistles and thorns” (Gen. 3:18-19), and that this life will be full of trouble (John 16:33). And yet, the Bible does have something of a theology of human flourishing. The concept is not totally foreign, nor at odds, with the Biblical worldview. The Biblical terms “shalom” and “blessed” focus on aspects of this very idea (for more see Jonathan Pennington “A Biblical Theology of Human Flourishing). 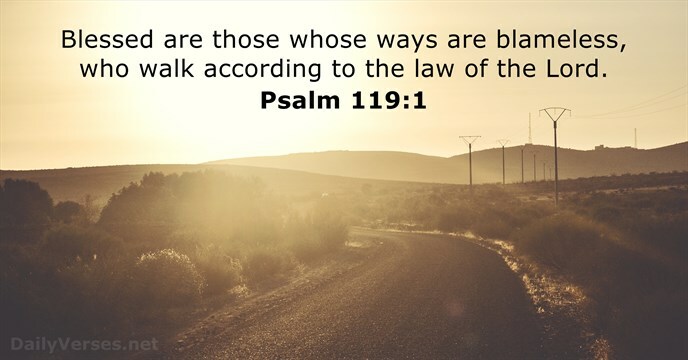 Psalm 119 ties this ideas to obedience to the Word of God. The person who is most “blessed,” the person who flourishes, is the one who keeps God’s testimonies (v. 2). So, the word “blessed” in this passages carries both the connotations of human flourishing and the connotations of favor with God. In fact, they go together. To walk in a “wide place” is to walk with confidence and security. A narrow spot would be tight and the walker would have to be continually on guard not to slip and fall from the path. But a wide place has lots of latitude and encourages a strong and confident walk without fear. The psalmist sees the within the borders of God’s law there is lots of space, and with that lots of confidence and security. In other words, he can flourish on this path. We see it too in other Psalms (Ps. 1:1-3; 112:1; 128:1). The principle is even applied in general with obedience to parents (see Eph. 6:3, referencing Deut. 5:16). Obedience leads to flourishing. This principle should make sense to the believer. If God created the world then He is the one who set up the way that it works. He is the one who set up what flourishing within this world should look like. When we attempt to succeed at life apart from Him, then, we are attempting to live in the world in a way contrary to His designs. That will always, eventually, lead to frustration and failure. But to live in the world according to the way of its maker is to find greater flourishing and success. The psalmist knows that and encourages us to experience what he knows: obedience the Word of God leads to human flourishing.